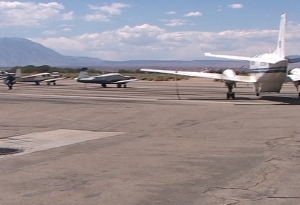 With improvement projects continuing to be completed and efforts to obtain necessary Federal certification ongoing, the Bishop Airport is closer than ever to being able to offer commercial air service for the Eastern Sierra. Fresh off the heels of Phase II of its Passenger Traffic Study, which included both short- and longterm flight forecasts subsequently approved by the Federal Aviation Administration (FAA), the Inyo County Board of Supervisors earlier this month authorized the County’s longtime airport consultant to begin work on obtaining the certification needed to accept commercial aircraft at the Bishop facility. According to Public Works Director Clint Quilter, Wadell Engineering Corporation will be developing a draft Part 139 Airport Certification Manual (ACM), which, after the promising results of the Phase II Passenger Traffic Study, felt like the next logical step for the County as it looks at commercial air travel from a regional perspective. Wadell has subcontracted with Ben Castellano and Art Kosatka, universally acknowledged experts in the field of airport compliance and security. Under Phase I of this effort, they will create the Airport Certification Manual, train airport personnel in Part 139 requirements, create an Airport Emergency Plan, and prepare an initial Transportation Security Administration (TSA) and security assessment. Phase II, which has yet to be approved, will entail finalizing certification and security plans and actions required for airline service. In the meantime, the County will be wrapping up more improvements at the airport this fall. A $1.8 million project to rehabilitate the aircraft parking apron is about 50 percent complete, and comes on the heels of pavement crack repairs, pavement sealing and paint markings, and terminal area security fencing installation that were completed in March to the tune of $1.6 million. Since 2013, when the County entered a Master Agreement for airport improvement project planning and engineering services with Wadell Engineering Corporation, $7.9 million worth of work has been done at the Bishop Airport. Airports cannot accept commercial aircraft without Part 139 Certification, and the Bishop Airport has not had a Part 139 Certificate since the 1990s. Also required in order to accept commercial aircraft is a letter of interest from an airline, which Inyo County received from Allegiant Air earlier this year. In its February 2017 letter, the airline stated it has the resources to connect service with a 156-seat A319 two times a week, initially, from Metropolitan Oakland International Airport, LAX, and Phoenix-Mesa Gateway Airport, contingent on Bishop Airport meeting the airline’s needs as well as state and federal regulations. The County is confident it can do both, and points to Allegiant Air’s initial interest as a good sign for the future of Bishop Airport and reliable commercial air service in the Eastern Sierra. demonstrate that in addition to an ability to enhance reliability at Mammoth, there is an appetite for air service above and beyond that currently supplied,” Quilter said. approximately $7.1 million in grant funding thus far to help cover the costs of the improvement projects. An informal review of the Bishop Airport by a regional FAA representative also informed the list of projects developed by the County’s consultant. And while lighting fixes and runway repairs were found to be necessary, the facility overall has many attributes working in its favor, including significant acreage (895), lack of airspace constraints, minimal crosswinds/wind issues, wide runways (150 feet), long runways (7,500 feet), two federal NAVAIDS on site, three separate runways, unlimited runway lateral clearance and night use, no limit to runway directional use, and the ability to host aircraft as large as 757s, 737s, and 319s. The runways are also incredibly strong – stronger than even the County had previously thought. According to Quilter, recent testing revealed runway strengths to be much stronger than the previously estimated strength of 240,000 pounds allowable for dual tandem aircraft (two sets of two wheels). Residents of Inyo County have been vocal for many years about the Bishop Airport being developed for the purpose of economic development. The County and Board of Supervisors are committed to exploring the option of commercial air service at Bishop Airport – and working with neighboring jurisdictions to provide the best commercial air service possible, in terms of number of flights and reliability, on a regional level. The Board believes great things will be coming to the Bishop Airport and is hopeful the entire Eastern Sierra will benefit as a result. Knowing the history of Allegiant and their track record serving small communities, I give them 2-3 months of serving Bishop before pulling out of the market because of low demand. I would expect a small number of locals to use the service, but not enough to fill several jets a week. How are visitors going to explore this area after arriving? There are only 2 major rental car companies operating in the Eastern Sierra with a handful of cars in each lot. There are no taxis in Bishop and a couple in Mammoth. That is Allegiants business plan, I don’t know how they remain profitable, but i’m sure it has to do with subsidies. I welcome the possibility of flights in and out of Bishop; it’s a long drive to Reno, and particularly in winter Mammoth is just not reliable enough. Even so, I too wonder if there’s really enough demand for this to sustain the service. Public transportation isn’t very comprehensive over here for basically the same reason. Maybe with increased reliablility and inclusion of traffic intended for Mammoth it’ll work, but I wouldn’t be too confidant. I think the airport would really help bishops businesses and would open up the city to a lot more tourist. The hotel owners should be thrilled. As long as The Town of Mammoth keeps their noses out of this it could work. Great opportunity to be an uber driver! The more I hear the stories about some of the creepy,crawly uber drivers doing crazy things,think if I needed,I’d either hitch hike or walk….seems safer nowdays. My wife and I are so thrilled for this airport to come into fruition. We have family who live in Denver and Rhode Island, and struggle year after year figuring how to visit or be visited. Do we drive 4.5 hours to Vegas for the cheaper more direct flight? Do we drive 3.5 to 4.5 hours to Reno depending on whether for more layovers and more expensive flights? One of the great forms of torture is a 4 hour drive after a 5 hour flight. Do we then take the unreliable and expensive mammoth flight which only lands half the time? Visiting family is the crux of our existience in th eastern Sierra, where we love work and play in one of God’s greatest creations. I have been here 10 years, my wife 4 years and we would love to start of family in this wonderful community, but we can’t help but consider leaving because of this senseless lack of access. If you build it, they will come! I live in Nebraska but visit Bishop quite often, fishing, hiking, mountains etc I would love to see this happen. We would certainly use the airline!